Russia’s new MC-21-300 airliner had made its first flight in Irkutsk today, on May 28, 2017. The first flight took 30 min at the altitude of 1,000 meters and at the speed of 300 km/h, reported Irkut Corporation, the aircraft designer. The flight plan included the aircraft in-flight stability and controllability checks. During the first flight the aircraft has also performed go-around maneuver followed by a flight over the runway, climbing and turning. The MC-21 crew commander Oleg Kononenko reported that the flight went in the normal mode. “There are no obstacles revealed preventing the tests continuation”. The copilot Roman Taskayev confirmed that the characteristics and operational modes of the power plant were confirmed and all aircraft systems operated without glitches. The MC-21 took off powered by Pratt & Whitney PW1400G engines. The alternative Russian powerplant – Aviadvigatel PD-14 is to be certified in 2018. MC-21 is the first Russian-made narrowbody commercial passenger aircraft designed in the post-Soviet era. The program was launched in 2007 and is headed by Irkut, a subsidiary of Russia’s United Aircraft Corporation. The flight prototype was rolled out in June 2016. MC-21-300 is a baseline variant that has maximum take-off weight of 79,250 kg and can carry up to 211 passengers for a distance of up to 6,000 km. The shorter, 72,560 kg MTOW, variant — MC-21-200 with 165 passenger capacity is at design stage. Irkut says that MC-21 aircraft is superior to existing counterparts in terms of flight-technical characteristics and efficiency. Its major contributor to the enhancement of flight-technical characteristics is the composite wing. 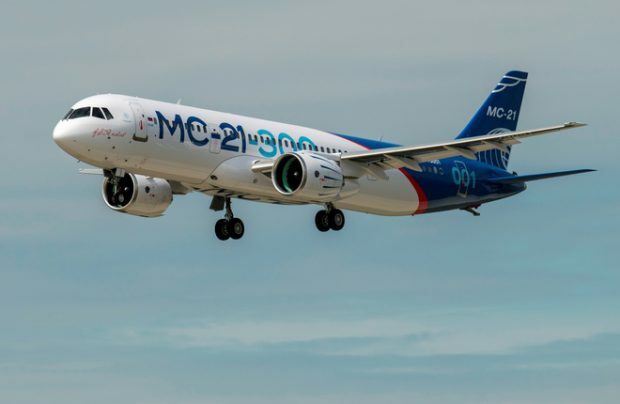 The share of composites in MC-21 design exceeds 30%. According to the designers, calculated reduction of direct operational costs for MC-21 is 12-15% lower than for counterparts. MC-21 certification in Russia is now planned for 2018 with the EASA certificate to be obtained a year later. The MC-21 backlog stands at 175 firm orders and more than 100 commitments. Russia’s largest carrier Aeroflot is expected to become the launch operator with first airframes to be delivered in 2019.